Kayaking, a canoeing-like activity that is lower to the water, is often thought of as individual activity. But fear not, there are kayaks made for two people, allowing you to share the joy of kayaking with a partner. These 2 person kayaks, referred to as tandem kayaks or simply tandems, are for those who prefer to be social – even on the water. Often overlooked by seasoned canoe lovers, the Coleman Colorado 2 Person Fishing Kayak by Sevylor offers various advantages to its users, it is the best fishing kayak for under $500. 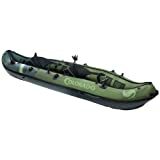 Unlike many fishing kayaks, which are made from rotomolded plastic, the Coleman Colorado tandem is a great inflatable kayak. While traditional kayaks make noises as you move, the inflatable ones enable you to have a silent and calming experience out on the water. This is especially important while fishing, as you wouldn’t want to scare off the fish before you even have a chance to cast your line. Who Is The Sevylor Coleman Colorado For? Read on to find out more about the Sevylor Coleman Colorado 2 Person Fishing Kayak. We have included its specifications and features as well as consumer reviews to help you decide whether it is the right one for you. Multiple Air Chambers allow the kayak to remain inflated even if one chamber is punctured. Adjustable Berkley® Quick-Set Rod Holders for hands-free fishing. Airtight® System to avoid any leaks. Trolling Sevylor® motor fittings expanding your fishing capabilities. Though this tandem kayak has a lot of advantages, it is best used for certain purposes. People who are looking for a fast canoe. Those that are looking for a well-tracking kayak. People who want to go on paddling excursions. Just like any product, the Coleman Colorado has its advantages and disadvantages. Below, we have compiled a list of pros and cons to help inform your decision. High maximum weight capacity of 470 lbs. Inflatable kayaks are viewed with skepticism by some. Many associate them with the quality of inflatable pool pieces or even inflatable beds rather than the rugged and durable materials they are made of. The Coleman Colorado is made of 18 gauge PVC material, which makes this tandem kayak pretty much indestructible. The Tarpaulin shield and nylon cover make the base even stronger. The overall structure makes this puncture-proof, salt-water proof and sun-resistant. The industrial, double ended drop stitch and I-bean construction make this a hulk. The Coleman Colorado tandem features two softback seats on board. The seating on board provides plenty of leg space for both riders. The fully adjustable seats, which are in easy reach of the storage compartments, ensure the utmost comfort during your kayaking experience. The rod and paddle holders ensure that everything remains secure during your journey out on the water. In terms of performance, the Sevylor Coleman Colorado inflatable kayak is solidly built. Though this might not be the best option for professional racing, it is a great option for recreational kayaking. The material makes this rigid but flexible where it counts. It is also simple to maneuver, making it a great for beginners. While this tandem kayak is designed for flat surfaces, it can be used on a variety of surfaces; however, it is recommended that you avoid white water. The majority of the reviews left by current owners of the Coleman Colorado have raved about this tandem fishing kayak. There are a number of reviews that praise the versatility of this product. Consumers even love having the option to upgrade the trolling motor, which provides kayakers with a more powerful motor. It is easy to inflate and deflate and it is stable on the water. The exceptional quality of the canoe is praised by all owners of Coleman Colorado. As it does not include a pump or paddles, most reviewers suggest that you purchase those items before purchasing the Coleman Colorado. We have created reviews for the best kayak paddles and the best electric pumps. Check out our reviews before you buy. The only downside that Coleman Colorado owners expressed is the potential for the rod holders to get in the way if you are not planning to fish during your excursion. However, many chose to overlook that small drawback in light of all the great features this tandem canoe has to offer. Very good review. I own the Big Basin, that is identical in construction and quality. Love the inflatables, and the Sevylor boats.